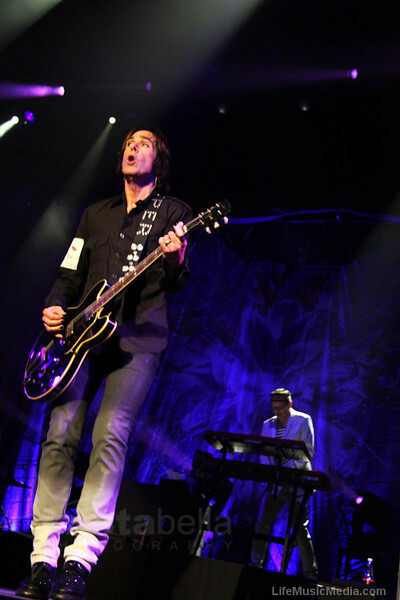 MELBOURNE - With just 90 minutes before showtime, I had the great honor of sitting down with Per Gessle back stage at Rod Laver Arena for Roxette's second Melbourne concert. We discussed all topics from Travelling to Charm School to the exciting soon-to-be-announcedNorth American Tour and everything inbetween. 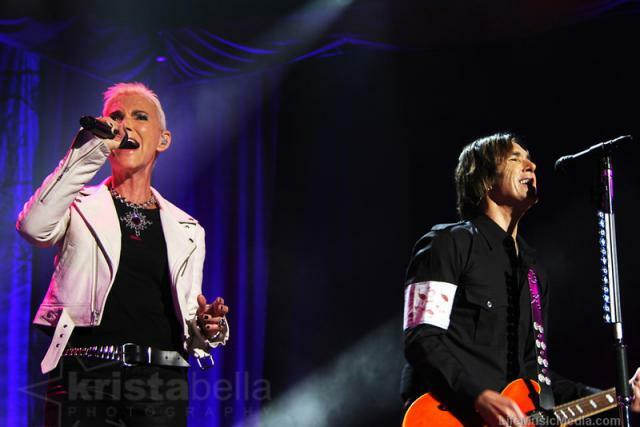 Enough talk: enjoy this exclusive Daily Roxette interview. TDR: OK, so first up, let's talk about Travelling. We've had Tourism 2, 2rism, T2 and nowTravelling, how did you finally decide on a title? PG: ...yeah, for me, I always thought that was a smart commercial move... but obviously I was wrong (laughs) ...but like I said, instead of having a big fight about it, we just decided to use something else and yeah, I guess it was a little confusing for those reading on the websites etc. TDR: OK, so I'm guessing you're not going to reveal too much about the new album, but what can you tell me and talk me through the structure, how many new songs and so on? TDR: ...so you don't sing on that song now at all? TDR: I'm guessing that "Excuse Me Sir, Do You Want Me to Check on Your Wife" is much like "I Never Quite Got Over the Fact that The Beatles Broke up" where the title doesn't actually feature in the song? Am I correct? PG: No. No. "Excuse Me Sir" is one of those songs where we sound like Tom Petty and The Heartbreakers, it's sung by me except the title which is sung by Marie, that's one of my favorite tracks, it's really cool. TDR: OK, well let me try it this way then. From the titles that were released the other day, does the single appear in that little list? PG: (Laughs again) Maybe... but I can reveal something else about one of those songs, there's a track called "It's Possible," there are actually two versions of that song on the album... two totally different versions. TDR: You mean a reprise like "Drowning in..." on Son of a Plumber? PG: Not really, no, two totally separate recordings. TDR: Wow. You've never done that before. PG: ...well it's like "Hjärta utan hem," (from Finn 5 fel!) we took that kind of arrangement and it works really well, so it became more like a sixties feel to it, we couldn't decide which version we prefer, so we actually took both... like you said, we haven't done that before. TDR: There was a rumor going around that there was a reinterpreted version of "What's She Like" on the album, is that still the case? TDR: Oh, it got dropped? No, wait, you tweeted that you recorded an acoustic version of "What's She Like" but then you said “don't ask me why”. TDR: OK. You don't have to tell me the title, but at least tell me if a decision has been made on the single? TDR: Of course... but speaking of a video, looking at your schedule for the next few weeks, do you even have time to shoot a video for the single? TDR: And is it Marie on the lead or is it yourself? TDR: So it's like in "My World My Love Life," the bridge, "do you want to talk about it?" "I don't know..."
PG: ...yeah, yeah, a bit like that... but it's different (laughs). TDR: Right, now I want to talk a little about the Australian experience, you guys go to Argentina and you experience sort of a Beatles-Mania thing over there, you sold out 15 shows in Germany and in Sweden you're practically royalty... but putting that all aside, surely this Australian tour has got to be a real feather in the cap for you? PG: This is just far out, y'know. Not only are we selling all these tickets, but we're also getting these fantastic reviews... and we're not really used to that, if we're lucky we have some fans in the press but most of the time, what we do, is for some reason, it's not classified as hip or critically acclaimed. So this is a new thing for us, so we're riding a really great wave in Australia and it's just fantastic, to be selling all these tickets is unheard of! We didn't expect that at all. TDR: Well you guys were knocked back by two different promoters, so when you found out that the "one and only show" in Australia (the Sydney show) had sold out in half an hour, what was that like? Talk me through that moment when you heard that news. PG: Well we talked early on about how we're gonna do it because obviously you can't bring the crew and the band and all the gear to a place like this without selling tickets, it costs a fortune. Y'see, the problem with all this is the freight costs, it's so expensive. So obviously you have to have some sort of guarantees from a promoter that you can afford to do this. So we managed to get that and then of course as soon as we heard that tickets started selling, everyone was like YES, then of course the promoter is in high spirits (laughs)... and then it just escalated, so one show became two shows and then three shows and then we heard that Rod Stewart was selling like 10,000 tickets in Sydney and we sold 30,000, it's just amazing! 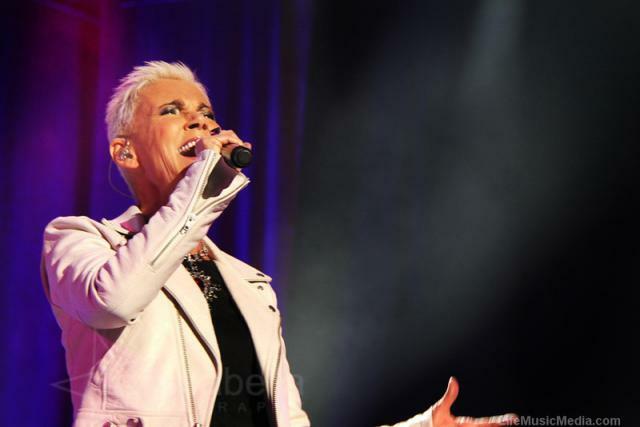 At this point Marie Fredriksson enters the room, walks over to her dressing room, says a friendly hello and leaves... Per and I return to our chat. PG: ...so yeah, it was all unexpected. TDR: But a real sense of vindication perhaps? PG: Yeah, I don't know, sometimes you're hot, sometimes you're not. But ever since we started this tour, when the band meets at the airports, I always tell the band to pinch their arm, appreciate this because you can never take something like this for granted, it's just amazing that it happened, let's just hope it continues. TDR: Of course! Was there any point where you thought it was all too hard, Australia's off the list, it's just not going to happen? PG: Well considering the latest reception with Charm School and even Have A Nice Day andRoom Service and the Greatest Hits album, I mean, that's no indication there. But it's the same with the UK, we sold 13,000 tickets in London at Wembley Arena but Charm School has sold 3000 copies in the UK, so, you know, someone is not doing their job right! TDR: I want to talk about the songs and setlist now. 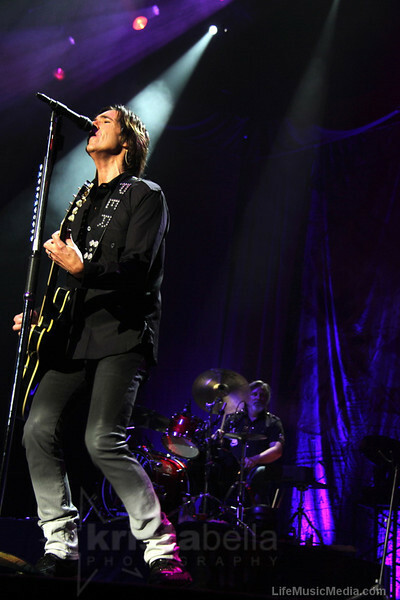 Obviously this band and sound has evolved from the Party Crasher Tour, but what was the motivation behind saying "right, for this Roxette tour, this is the sound we want, these are the arrangements we want, we want to do this guitar/power pop thing," what was the decision behind that? PG: ...absolutely. And also I wanted Christopher to be the guitar player instead of the bass player because he's so much part of the "new" Roxette so to speak. And we wanted to do "The Look," "Joyride," "Dangerous," "How Do You Do!," all those songs in a slightly new way... in sort of the same way as I did it on my Party Crasher Tour. I think, even though the Party Crasher Tour wasn't the biggest tour on earth (laughs) and actually I didn't lose money but I also didn't make any money on that tour, regardless, it's the whole essence of what this is all about, without that tour I don't think this tour would've happened at all because we were ready, we knew that the band was just fantastic and some of those shows as you can hear on the live album Gessle Over Europe were just fantastic. For me it was such a revelation to play "Dressed for Success" or "Sleeping in my Car" even with a band like that, it was like playing with Gyllene Tider which is such a gas, it's fantastic because it's such a great power pop band! TDR: Regarding the song choices, you're not snobs, you guys play the hit singles and that takes up 70-80 % of the show, but what about that final third? How do you get there? How do you know to go with "Things Will Never Be The Same" from Joyride but not "(Do You Get) Excited?" or you play "7Twenty7" but not "Pay The Price," guide me through that creative process that takes you from a hundred odd songs to just twenty. At this point BoJo from Live Nation enters the room and reminds us that our time is up, but Per graciously requests five minutes more ! PG: ...the problem that we have is that it's really hard for Marie to remember all the lyrics. Like tonight for instance we're doing "Silver Blue"... hopefully, ha ha ha! But the other day we were supposed to do "Stars" but like 3 minutes before the show Marie says "I can't remember the lyrics..."
TDR: ...so you went back to "Only When I Dream"? TDR: Well in an ideal world, what would you like to play? PG: "Paint!" And we talk about "Run To You." I would love for us to play "Milk & Toast & Honey" but it's not like 'hey let's do it on a sound check and try it tonight', it's a big thing. And of course there are two or three songs off the new album that we might wanna put in there down the road. TDR: Because of the power pop approach has that perhaps influenced songs choices for the set list? Perhaps you can't play a very produced track like "Dance Away" whereas it's easier to play "Watercolours in the Rain," do you feel it's affected song choice? Per mimics the "Dance Away" riff and guitar. PG: ...because that song is very Jonas (Isacsson) and it'd be cool to hear Christopher play that, it could turn into a soul pastiche or something, could've been very cool. So it's never an option to use sequencers or fake drums, it has to be classic live. TDR: Well I suppose if you can play "Stars" live you can pretty much do anything live. TDR: The next question is for our Kiwi cousins, playing in New Zealand? Is that back on the agenda at all for 2012? TDR: ...logistically it must be hard. Per notices my eyes light up like a kid in a candy store. PG: ...not next year... but down the road, we'd love to come back. TDR: So Marie definitely wants to keep touring? PG: Oh yeah! We just talked the other day about Leonard Cohen, he's been doing 240 shows since 2008 and we're up to 85 today. So it looks like we're doing America and Canada and Mexico in August and September. TDR: Well that was my next question, is there some hope for North American fans? TDR: ...wow, big news, am I allowed to put that in the article? PG: Absolutely! So it looks like the tour will finish up in Mexico City. TDR: Wow! What a way to end it all, with some Tequila? PG: (Laughs) Sure. But then we said, let's keep the band going! Even if we end the tour in Mexico City, that doesn't mean it has to take three years til we start work again! Maybe we can do something over the New Year? Maybe we can do some festivals next summer? TDR: Yeah, just keep the train going! PG: Yeah, keep the band going, everyone loves to play and we all enjoy each other. The more we keep going, the better it is. TDR:... is there a reason you didn't call it the "Charm School World Tour"? PG: Yeah because we decided half a year ago that there was going to be a new album (Travelling) so we thought Charm School would become old, so it feels silly to call it Charm School because in a month from now Charm School will become history. TDR: Well, it's been twelve months since you released Charm School, forgetting its success or chart positions, what's your perspective on the album now, a year on? Do you like it more? Like it less? What are your thoughts now on Charm School? TDR: ...she's back in the rhythm? PG: ...not since last summer (laughs). PG: ...no, well I was, I was the one who loved that, it was Clarence who always hated it. TDR: ...yeah it is! And the middle 8, it's fantastic! TDR: Now there was supposed to be a live DVD recorded in Spain and that got postponed, what's the update with the DVD? TDR: … is that separate or is that on the same disc? 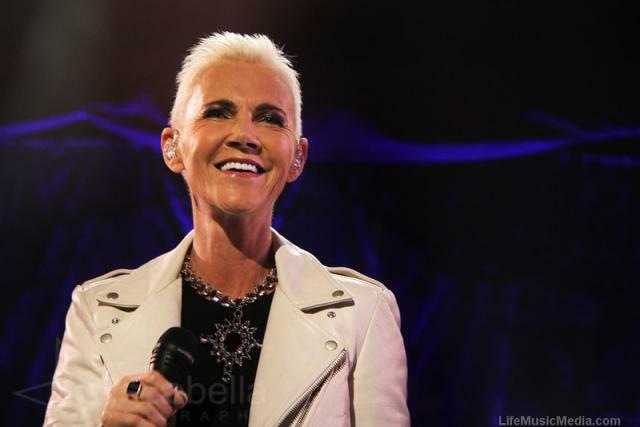 TDR: It's about time for an updated Roxette documentary. PG: It is! Absolutely! I think so. TDR: And finally before you go, the "Small Apartments" soundtrack, what can you tell me about that? I hear there's some stuff from Son of a Plumber? PG: It's got some new stuff, lots of old stuff... not only from Son of a Plumber but also fromMazarin but we're talking about instrumental versions, because it's for the movie. See, in the movie, let's say Jonas Åkerlund) is using 45 seconds from "I Have a Party in my Head" but on the soundtrack we have a full version of "I Have a Party in my Head" but it's instrumental, so we re-recorded all these songs, there's some new stuff and there's actually a cover version as well from... uhh... well... I shouldn't say what it is... but it's a cool album! We tried to make a soundtrack that is not only music from the movie but it's also easy to listen to as a normal record, so it'll be out... I don't know when... but I think the movie's going to be released in March I think? TDR: Well there are some big stars in the film too. PG: Yes and it's a great movie! I think the premiere is at a film festival in Austin Texas. And with that, Per heads off to make up to prepare for the second Melbourne concert and ends our 10 minute chat which went for exactly 26 minutes and 51 seconds, but who's counting, right? And just on a personal note, I cannot over-emphasize how genuine, friendly and accommodating Per was. His enthusiasm talking about new material is infectious and that the fact that he was the one who requested five more minutes from Bo just demonstrates how Per treats the fans, pure class! A huge thank you for all involved in allowing this bumbling half-wit from Australia to pester Per just an hour before showtime, so a big thank you to Marie Dimberg of d&d, Bo Johansson of Live Nation, Thomas Evensson of TDR and of course, Mr. Gessle himself who were all unbelievably gracious and hospitable! 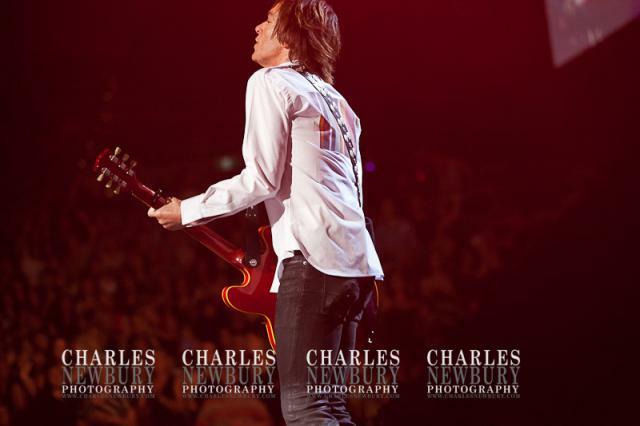 Roxette continues its Aussie tour on Friday night in Brisbane, before Sydney for the final time and then two shows in Perth!